PCG is thrilled to announce that Charles Simone, MD, from the Maryland Proton Treatment Center, has been appointed as the Chairman of the PCG Executive Council. Dr. Simone currently serves as the chair of the PCG Lung Committee and will now also lead the Council’s efforts to provide oversight for all PCG committees, protocol development and approvals, clinical policies and procedures, and organizational strategy implementation. Congratulations Dr. Simone! Dr. Charles B. Simone, II is the Medical Director of the Maryland Proton Treatment Center and an Associate Professor of Radiation Oncology at the University of Maryland School of Medicine. He completed his undergraduate and medical school training at the University of Pennsylvania. He completed an internship in internal medicine, and then he completed residency training in radiation oncology at the National Cancer Institute (NCI), National Institutes of Health, where he served as chief resident. 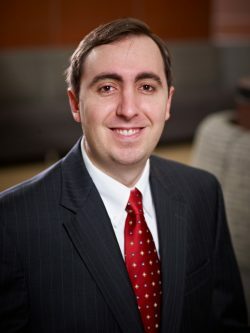 Prior to his appointment at University of Maryland, Dr. Simone was an Associate Professor of Radiation Oncology, Chief of Thoracic Oncology at the Hospital of the University of Pennsylvania, and Director of the Penn Mesothelioma and Pleural Program for the University of Pennsylvania Health System. Dr. Simone treats patients with malignant pleural mesothelioma, lung cancer, and other thoracic malignancies with proton and photon radiation therapy and photodynamic therapy (PDT). He is a National Institutes of Health, National Science Foundation, and Department of Defense funded investigator who performs clinical and translational research investigating the use of proton therapy for thoracic malignancies. He is the Chair of the Proton Collaborative Group (PCG) Lung Committee and the Chair of the American Society for Photobiology (ASP) Education Committee. He is appointed to the NRG Oncology (formerly Radiation Therapy Oncology Group [RTOG]) Lung Cancer Core Committee; NRG Radiation Oncology Committee; NCI Thoracic Malignancies Steering Committee Mesothelioma Working Group; International Thymic Malignancy Interest Group (ITMIG) Research and Infrastructure Committee; ITMIG Thymic Carcinoma Workgroup; American Society for Radiation Oncology (ASTRO) Lung Cancer “Blue Ribbon” Panel; PCG Reirradiation Committee; Particle Therapy Co-Operative Group (PTCOG) Scientific Committee; and multiple PTCOG Clinical Subcommittees. Dear Chuck, needless to say we are so so proud of your accomplishments all throughout your inception into the scholastic world,you and your family have allways been at our sides for each and every problem that we think we may have,will never be able to thank you for all you folks have done for all.